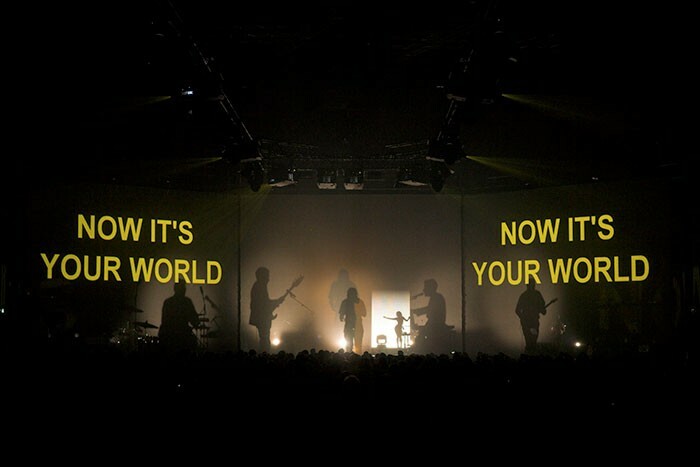 HSL supplied lighting for the UK and German performances of ‘Massive Attack v Adam Curtis’ a mind-blowing mixed-media installation created by incendiary film maker Adam Curtis and activist band Massive Attack taking the semantics of image-music-text into a new dimension. The show was world premièred at the Mayfield Depot in Manchester as part of the 2013 Manchester International Festival (MIF), then played at Kraftzentrale at Duisburg’s Landschaftspark at the 2013 Ruhrtriennale International Festival of the Arts culminating in a run at The Park Avenue Armouries in New York last week, making a serious impact. The majestic faded elegance of the Mayfield Depot provided a perfect backdrop for the world première. Operating between 1910 and 1960 as a bustling train station and from 1970 – 1986 as a major Post Office sorting centre, since then it has lain derelict and neglected until the MIF re-appropriated it for this performance. 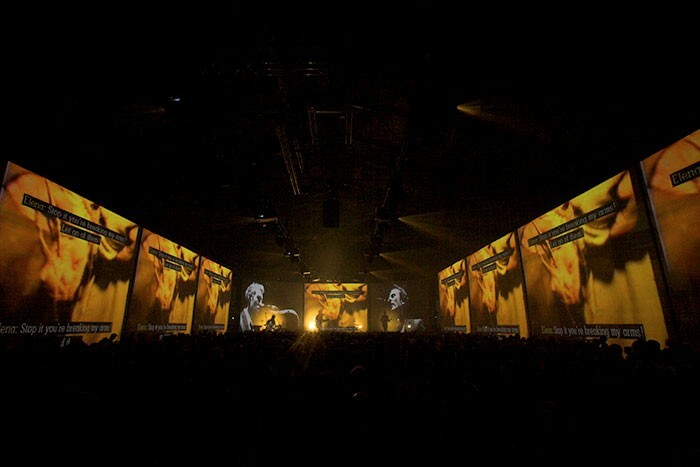 The location itself was the first challenge for any production installation. The HSL team came on site a week before the production to reactive the house three phase power, coordinate the installation of three generators and run a power distribution infrastructure for sound, lighting and video and other production elements as well as the bar and front of house areas. They also installed a complete working light and safety light system throughout the space. Above the 2000 capacity standing audience space, a main box truss provided hanging points for the 12 projectors and for various lighting fixtures. Parts of the performance had lighting effects in, on and around the audience, all adding to the dramatic, intense movie unfolding, complete with its haunting sound-track. Lighting in this area comprised 12 Martin MAC III Profiles, 30 1kW Fresnels, used as house lighting and eight Atomic Colours. On stage behind the screen for illuminating the band, Oliver positioned 20 ETC Source Four Profiles for band key-lighting and six Robe MMX Spots to light the gauzes and the band from behind. He used the animation wheels and shutters of six MAC III Performances for additional effects onto the gauzes in front of the band. Six Robe ROBIN 600E Spots were utilised for colour changing back key lights, while 20 650W Fresnels proved ideal for throwing shadows onto the gauzes, together with five Lowell Omnis, used for producing larger close-up and double shadows. There were also another five Atomic Colours on stage with the band behind the gauze. Back-lighting the 11 gauze screens around the arena were 44 Martin XB Wash moving lights, some mounted on flightcases. These were used subtly for creating continuity between the screens at certain points. Eighteen 2kW Fresnels were dotted around the place and used at the end as the dazed and emotionally drained audiences re-orientated themselves, and as the reality of what they had just seen began to sink in. At the end of the shows in Manchester and Duisburg, people exited via dark long spaces immediately behind the performance arena and right at the far end of these was a single 7kW Falcon Beam high powered searchlight scanning at low level.